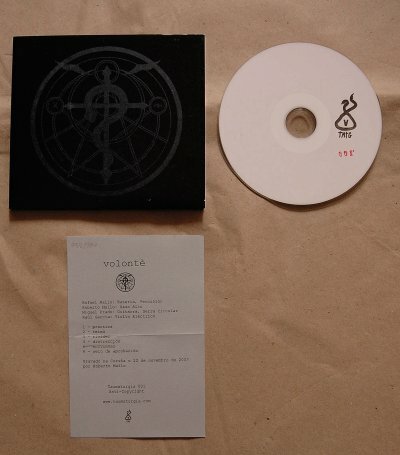 Volontè is an improvisers collective from A Coruña, this is their first record. This time it’s the quartet of Rafael Mallo (drums and percussion, with another CD-R released by Taumaturgia, Vribación), Roberto Mallo (alto sax), Miguel Prado (guitar, circular saw) and Raúl García (electric violin). Download formats and streaming from archive.org. A new label from Galicia, the northern part of Spain, and they release improvised music, the music of here and now. I received information on three releases, but there were only two in the parcel. The first is by a band named Volonte, a five piece (but working in various combinations, here four are present) from Galicia and the recordings here were made in October 2007. Must have been a fruitful (or long) day, since it has 76 minutes of music on it. The instruments are guitar, circular saw, alto sax, electric violin, drums and percussion. Their improvisations are loud and noisy, even when they sometimes pull back gear and make a few moments of silence. The recording is a pretty much ‘in your face affair’ and especially the alto saxophone plays like he wants to create some sort of feedback. I must say that I rather enjoyed it, but that the overall length was a bit too much. Not every moment of their playing was equally strong, but it of course fits the idea of improvisation. Volontè is Miguel Prado (guitar, circular saw), Roberto Mallo (Alto sax), Raúl Garcia (electric violin) and Rafael Mallo (drums, percussion), here serving up some 76 minutes of harsh noise with a free improv tinge, kind of like an extreme Emanem session. A little too scratchy/squealy for my taste (especially the alto, which wears thin) and longer than it needs to be. Gels here and there in a rough, industrial kind of feel, but not often enough, though the last track begins to smoke.